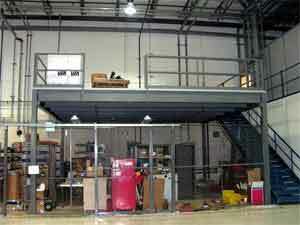 Steel Storage Mezzanine Installation & Sales Nationwide. When the amount of space available within your building is at a premium, and you need more storage space but cannot sacrifice any of your production area, then there are only a few options open to you. For many people, their first instinct is to extend their building to accommodate additional space, but this is a costly and time consuming option. It is much more effective to choose to install a steel storage mezzanine that will provide you with a massive amount of additional space within your existing building without the need for a costly extension. If you choose to build an external extension to your existing facilities, then you will need to appoint an architect, builders, and then have the whole project approved and signed off. From the time when you first start the process of having the building work done until the time you are able to move your equipment in can be a period of months, and the impact on your productivity during that time will be severe. 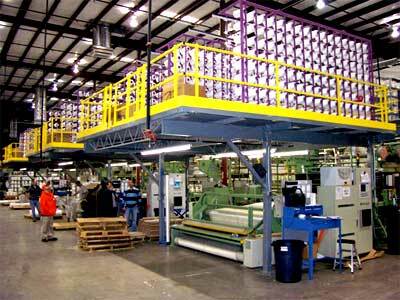 It can be so time consuming to build an extension to a factory that many businesses relocate. With a steel storage mezzanine, you have none of these problems. Thanks to its entirely modular construction, and the fact that each unit is specially designed for the exact needs of your workplace, a steel storage mezzanine will provide you with exactly how much additional space you need without any hassles, and thanks to it being flexible, it will grow with you, and allow for further expansion in the future. Easy Rack is one of the leading producers of internal modular construction systems, Easy Rack is able to provide a wide range of steel storage mezzanine systems that can be installed in your premises quickly and effectively with none of the logistical problems that an entirely new external building would create. A mezzanine allows you to expand into space that you already have, giving you the most cost effective way of creating more storage room, while thanks to the high quality of the materials used, the wide spans between the supporting legs and the advanced design of this steel storage mezzanine installation, there is little impact on the amount of usable space available underneath. The steel storage mezzanine sales provided by Easy Rack include the whole process of planning, delivering, and installing the units in your facility. Our involvement throughout the whole process of delivering the system that you want enables us to provide a first class service, and a product that is entirely designed and made to your exact needs. The level of detailed planning that goes into each unit is astonishing, and aspects such as the specific seismic loads that the unit is likely to face are considered in its manufacture. For convenience, the whole of the steel storage mezzanine installation can be constructed without a single weld. This means that when it is time to move on or to extend further, your mezzanine can be adapted to the new requirements, or simply knocked down for transportation to a new location where it can be rebuilt in a matter of hours. You can choose from a number of different designs for your mezzanine including open areas with a guard rail for protection, or a fully enclosed room that can be accessed through a lockable door in order to provide a place to store expensive or valuable products. 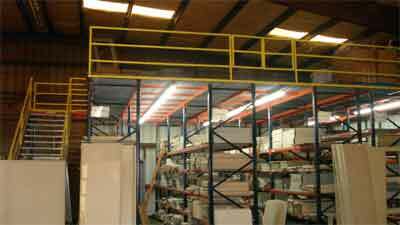 There are a number of huge advantages of extending your usable space upwards with a mezzanine storage platform.